On Wednesday August 4, the 12 participants in this year's Carnegie Summer Scholars Program, presented the results of their summer's work in the Greenwalt Lecture Hall on the Broad Branch Road Campus. Projects carried out by the Summer Scholars this year spanned a broad range of topics, including mineral physics, seismology, astronomy, organic geochemistry, high pressure chemistry and studies on the origins of life. The summer scholars have now returned to their home institutions, but many will be presenting their results at national meetings in the coming year. 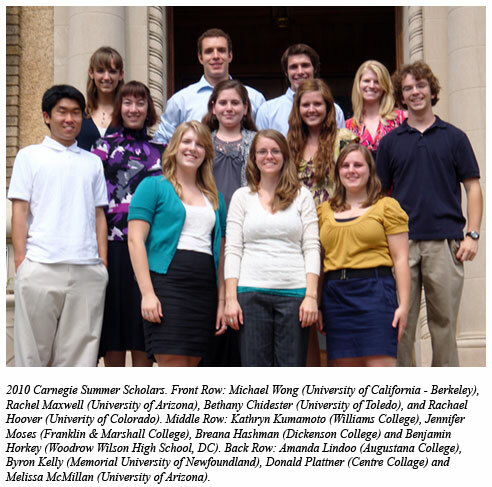 The Carnegie Summer Scholars Program is jointly funded by the National Science Foundation/Research Experiences for Undergraduates program and the Air Force Office of Scientific Research (ASSURE program).